One of the biggest complaints I hear from people attempting a Paleo diet is that Paleo is hard to plan for. Nada. It’s not hard to plan for, but it is hard to do without planning. Living a Paleo lifestyle does require foresight. There are few to zero “convenience foods” that pass Paleo muster, and while there are some insanely quick, easy Paleo recipes (e.g., check out my Insanely Lazy Quick Paleo Dinner), not planning ahead of time will almost always leave you staring, eyes glazed, in the frozen pizza aisle at 8 pm on Tuesday night. Yuck. It’s worth taking the time to plan. I promise. So how do you plan a week’s worth of Paleo-licious meals? The resources are out there. New to Paleo? Check out my list of favorite Paleo resources. On Sunday afternoon, I sit down at the kitchen table with my iPad and my stack of cookbooks. I have two pieces of paper – my Menu list, where I write down what we are going to eat for the week, and my Grocery Shopping list, which is where I record all the ingredients I am going to need. Once I have it all planned out, I write the options on my kitchen wall wipe-off board – but we’ll get to that more in a minute. My husband has a raging sweet tooth that we try to keep in check with my very own Coconut Pumpkin Egg Muffins or Practical Paleo’s Carrot Gingerbread Muffins. And just in case we start to run out of breakfast servings, I’ll whip up some Sweet Potato Hash or hardboiled eggs just to get us through the week. I try to pair 1/2 an avocado every morning with whatever I eat – just ‘cuz it’s delicious. Lunches are where I cut corners. I rarely plan lunches; instead, I make sure that every dinner we prepare makes at least four servings – that way we eat leftovers the next day for lunch. Paleo is not the place to be picky. But say you hate leftovers – what are some good lunch options? Bacon Egg Salad or tuna salad is delicious served on bibb lettuce. Buy a cooked rotisserie chicken (Whole Foods has delicious rotisserie chickens for $7.99) and then cut hunks off that sucker for lunch all week. Cook chicken strips or sausages ahead of time with sliced bell peppers; wrap in lettuce leaves and top with guacamole for lunch. Make a huge salad. Lunch on the run? Check out my list of Paleo Eats in Colorado Springs. So, here’s the major thing – Paleo dinners. I plan for five-six meals every week. I try to find a mix of super-quick-easy recipes for the nights when I go to CrossFit – because by the time I get home, I’m ravenous and I need food, stat. Sometimes that involves crockpot meals that I throw together before leaving morning (and literally, I mean throw together because I’m usually running 30 minutes late). Curries are one of my favorite crockpot meals to make – check out this Jamaican Chicken Curry. If you’re chili people, then do some bean-less chili batches. Burgers, sausage and bell peppers, spaghetti squash and either meat sauce or meatballs – it’s all the “usual” fare, just without the added grains, legumes, sugars, processed foods, etc. Sometimes I make more involved meals that require roasting, grilling or baking. I plan those meals for the nights when I lift at work, leaving my evening free. 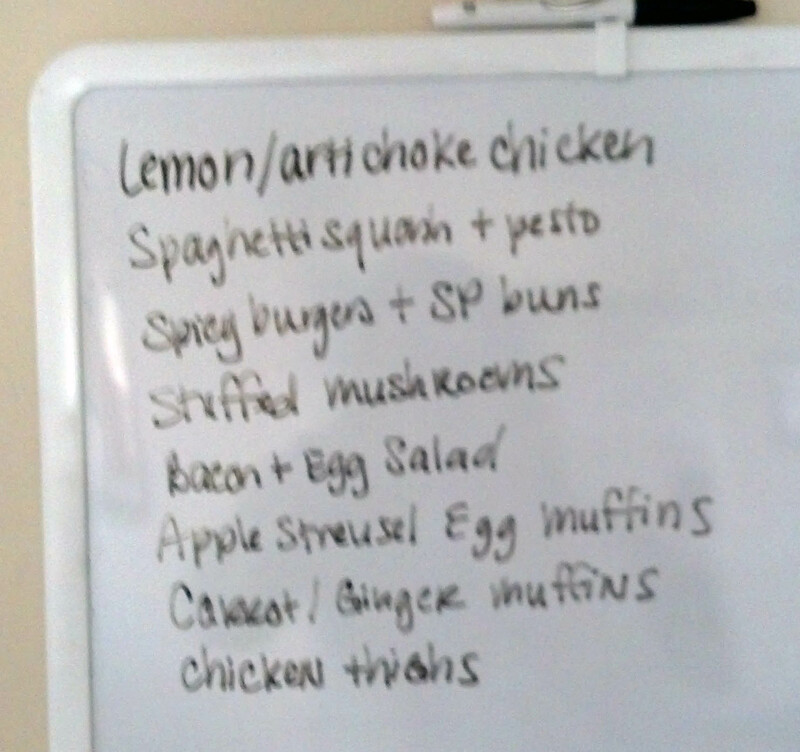 Here is what I am talking about – this is my sample Menu from last week. As you can see, it’s not very complicated. Breakfast was the same every day – Apple Streusel Egg Muffins and Carrot Gingerbread Muffins (both from Practical Paleo), tossed into lunch sacks as we headed out the door. Dinners were 1) Lemon Artichoke Chicken (delicious for lunch the next day) and 2) Stuffed Mushrooms (both from Practical Paleo), and 3) Chicken Curry with Vegetables and 4) Spaghetti Squash with Pesto (both my inventions). We ate out the 5th night. Lunch was leftovers, except for one day when we had Bacon Egg Salad (again, Practical Paleo). The Spicy Burgers with Sweet Potato/Carrot Pancake “Buns” were our Easter lunch. I usually add a “Veggies” column where I capture all the delicious pairings, but I was lazy and didn’t do it this week. Next time, I promise.